SINGAPORE - Robots and firefighters will soon tackle emergencies side by side, extinguishing fires, transporting casualties, and even saving lives. For instance, a new portable emergency responder robot, the Red Rhino Robot - called 3R for short - will be able to reduce the manpower required to respond to fires. 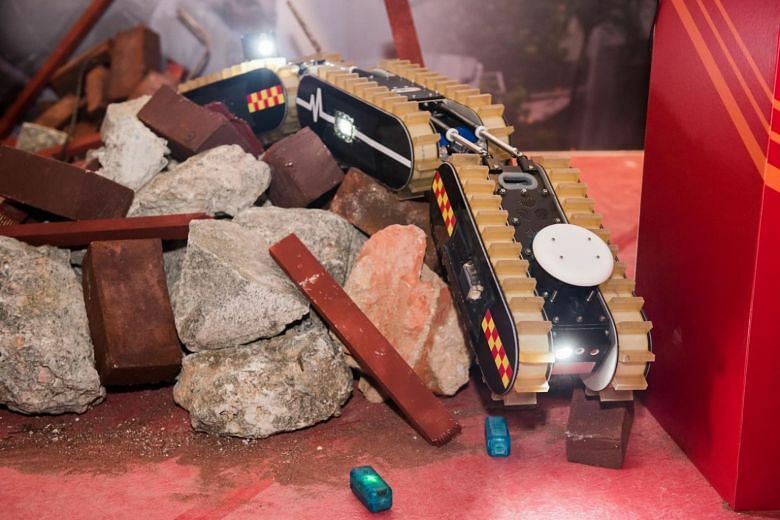 With robots, the Singapore Civil Defence Force (SCDF) can move away from the usual four-man crew to a "3 + 1" model of three firefighters and one Red Rhino Robot, SCDF said at its annual workplan seminar on Wednesday (April 18). The robot was launched at the Singapore University of Technology and Design by Minister for Home Affairs and Law K. Shanmugam, the event's guest of honour. It was among several new innovations and equipment unveiled by the force, some of which featured robotics heavily. The Red Rhino Robot, which has autonomous firefighting capabilities, will be fitted into the sixth-generation Light Fire Attack Vehicle and equipped with an initial firefighting medium of compressed air foam. This will buy the firefighters some time as they set up their main water line. In a speech, Mr Eric Yap, the commissioner of SCDF, highlighted the force's focus on robotics, automation and smart solutions in the coming work year, citing the need to "balance between higher operational loads and limited manning in the future". Other new technological innovations launched on Wednesday include the Life Detection Robot, which will help the rescuers locate signs of human life in urban search and rescue operations, and the SCDF Exoskeleton developed jointly with local engineering company Hope Technik and the Ministry of Home Affairs. A frame to be worn by firefighters, the Exoskeleton bears the weight of firefighting equipment and comes with pneumatic pistons that will help to push firefighters up when they are climbing stairs. Hope Technik was also involved in the development of the Red Rhino Robot. SCDF's Life Detection Robot, which will help rescuers locate signs of human life in urban search and rescue operations. "Technology, capabilities are necessary for SCDF to stay ahead of the increasingly challenging operational environment," said Mr Shanmugam. All newly-launched innovations are currently at the proof-of-concept stage and on trial by the force both in controlled and real-life environments. The final evaluation of the Life Detection Robot will take place by the end of the month. As part of the force’s move towards smart solutions, an indoor tracking system was also unveiled at the seminar. Through this, firefighters’ locations and vital signs, such as their body temperature and heart rate, will be tracked via sensors on their equipment, providing crucial information to ground commanders and aiding decision-making during operations. Apart from new robotics innovations and upgrades, steps are being taken by SCDF to ensure more prompt responses to small fires and the efficient use of the force's resources through engaging the public. Mr Shanmugam has also launched a new government scholarship for paramedics, to groom potential future leaders of the force with clinical expertise. Scholarship recipients will study para-medicine or related disciplines in overseas universities. He stressed the importance of SCDF personnel. “At the core, we need professional, dedicated and courageous SCDF officers,” he said.